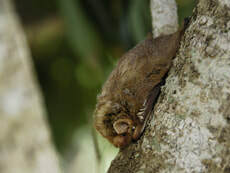 Description: The fur of male eastern red bats is usually brick-red in color, but can be reddish-orange or yellowish-red. The fur of female red bats is duller and lighter in color. This is unusual because color differences between male and female bats is rare. A patch of white fur is often found on the shoulders and wrists. The eastern red bat and the Seminole bat are closely related, and similar in appearance, but the fur of the Seminole bat is more mahogany in color, and there are no color differences between male and female Seminole bats. Florida roosting preferences: Solitary. Roosts in tree foliage or bushes. It usually hangs from small branches or twigs, and appears much like a dead leaf. Food preferences: Insectivorous. Feeds on moths, beetles, mosquitoes, leafhoppers, planthoppers, flies, and other insects. Although they capture most of their prey in the air, they have occasionally been observed gleaning insects from objects and the ground. Can often be seen foraging for insects around streetlights. Reproduction: Females give birth to one to four pups in late May or early June. Florida status: Common in north Florida and decrease in abundance to the south.